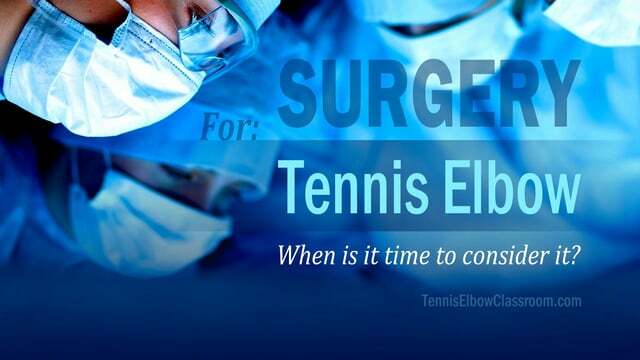 Home » Treatments » Tennis Elbow Surgery: When Is It Time? If you're like most people, however, you regard surgery as a last resort – A serious decision not to be rushed into or taken lightly. So how do you know when it's time – that you've completely exhausted your more conservative options, and it's time to step aboard the ship to the “last resort” AKA: Scalpel Island? Are you a good surgical candidate? What if surgery fails and you're worse off? Is surgery really your last resort? And then there are several types of surgery to choose from, including: Open surgery vs. closed / Arthroscopic, the new 'Tenex' procedure and the semi-surgical therapies like Platelet-Rich Plasma, Prolotherapy, and Dry Needling / Fenestration, but that's a topic to be covered in another article. Are You A “Good Candidate” For Surgery? One of the biggest considerations you're going to face is whether your case of Tennis or Golfer's Elbow is severe enough to warrant surgery. First of all, your Orthopedic Surgeon should have a clear, strong opinion about whether your injury is surgically repairable or not, based on all the information he or she has. Of course, you're the ultimate authority on your health. You have to make the decision about having surgery or not and bear the consequences of it, so the more you know going in, the better. So, what exactly is the criteria which makes you a good, great or poor candidate for surgery? It's not entirely about how much pain you're in, how debilitating your injury is or how long you've been injured – although, those are the factors you're most familiar with (too familiar with!) and care a great deal about, naturally. It's ultimately about those factors PLUS the objective measures – As is how much damage the scan of your elbow shows. And, conversely, it's actually possible to have extensive tendon damage and to NOT be in that much pain (Or any pain!) – And to not have much if any strength or mobility limitations. So, what you really “want” is the combination of a clear diagnosis of significant tendon damage and significant pain and loss of your normal function. The Diagnosis: What Does The MRI Show? Depending on the type of surgery you're looking at, you can expect to have either an MRI scan or a Sonogram (Diagnostic Ultrasound) in advance to get a definitive diagnosis. But if tendon degeneration is all the MRI scan or Sonogram shows, and it's mild – or even moderate, and not too severe – that alone doesn't make your injury a slam-dunk, obvious case for surgery. There is still a good chance of recovering from mild or even moderate degeneration / Tendinosis. However, if the scan shows severe degeneration and / or a tear in your tendon, that's a lot more conclusive evidence for surgery. Tendon tears are the most serious and persuasive findings. And eventually, the weakened tendon tears, in some cases and the longer that persists the worse the tear tends to get. At What Point Is The Damage "Too Much" To Recover From? Tendon degeneration past a certain point of severity, (somewhere in the moderate to severe range) becomes unlikely to heal without drastic intervention - Of course, precisely where that “line of demarcation” lies for you or any individual is very hard to say. But, for moderate tears, the difficulty of healing gets very high. Severe tears are impossible to recover from without surgery. Again, it's up to you, but if all your MRI or Sonogram shows is mild to moderate Tendinosis and no tearing, you may not need surgery and may be able to recover without it. How motivated you are is also a big factor - How hard are you willing to work at it in order to avoid the surgeon's scalpel or Arthroscope? On the other hand, if your diagnosis includes severe Tendinosis – And especially if it includes a tear, worse still, if that tear is moderate to severe, you may be a very good candidate for surgery. What's The Success Rate Of Tennis Elbow Surgery? No, there's never a guarantee that any treatment or intervention with work in every case, but surgery is also a big investment with a fairly significant wait to find out if it worked. And one of the big advantages to most conservative approaches to treating Tennis and Golfer's Elbow is that, although they may not work there is no big downside. Surgery itself is in a category all its own, however. It's a traumatic intervention itself with significant risks. If your surgical procedure fails to address your injury and restore you to full painless function, there's a good chance you will actually be worse off, unfortunately. Even if your surgery goes entirely according to plan (depending on the type of surgery) you will face a limiting a post-surgical recovery period. During this recovery period you may be in a restrictive brace or cast that doesn't allow you to bend your elbow, or use your arm or hand for 1 to 2 weeks. Followed by a less restrictive brace that allows elbow movement for a few more weeks, but you'll have to be very careful in how you use your arm to avoid traumatizing your recently repaired and vulnerable tendons. That's really just the beginning of your healing and rehab, however. After that the real work begins: Rehab exercises. How Long Does It Take To Recover From Tennis Elbow Surgery? Surprisingly, after 6 months to a year of pursuing “conservative” measures – including months of rehab exercise – You can still face the prospect of up to 6 more months to a year to fully heal and recover from your Tennis Elbow surgery! And you may actually experience mild soreness for 3 to 6 months. Then, at some point after your initial post-surgical recovery, (3-6 weeks?) you'll need to begin a course of rehab exercises. No matter how long and hard you tried to recover with exercises before surgery, you basically have to start all over again, as if from scratch – and continue exercising diligently for 3-6 months, minimum. And to top it off, you may need to do those rehab exercises for as long as a year. But, the fact is, you will have to undergo all these inconveniences, including the surgery itself and months of rehab before you know if it was a complete success, a modest improvement or a dismal failure. And as we already covered, surgery doesn't always work. How long will you have to wait and do rehab exercises before you know if you're recovering or not? That's difficult to say, but be prepared to put in 3 to 4 months of rehab before you start to conclude it's not getting better and you want to give up. Even Surgery Is Known To Have A Placebo Effect! "Another procedure that is in decline. The condition largely gets better over time and surgery doesn't add anything to that process." A recent medical study from 2012 lends credence to Dr. Harris' claims - especially when it comes to surgery for Tennis Elbow. This looks to be the first time a study was done to compare the standard Tennis Elbow surgical procedure against the placebo effect by giving a "fake" / sham surgery to the control group. The surprising result was that a "fake" placebo procedure performed no better than a genuine Tennis Elbow surgery! The key takeaway, however, is that the group which received the real surgery didn't end up doing any better – and were in more pain at the 2-week mark because of the surgery! Are You SURE It's The Last Resort And You Really Need A Procedure? The ultimate question: Are you sure it's your last resort, you've done everything you possibly could to treat your Tennis or Golfer's Elbow conservatively? And even if you believe you do need it, are you prepared for the hassles, risks and inconveniences of surgery? It gets a lot easier to decide, of course, if you have an MRI and it shows severe Tendinosis (degeneration) and/or a moderate to severe tear in your tendon, and all logic suggests you're not going to be able to heal that damage without surgery to remove the damaged tendon and repair it. AND you have severe or persistent pain or weakness and it's interfering with your work, hobbies or sport – generally making your life miserable, so you just can't live with it. But what if you're on the “border line,” so to speak? You could consider Platelet-Rich Plasma injections. That's still a kind of surgery, but it's a lot less invasive and has a much shorter recovery period. Have You Treated The Root Causes Of Your Tennis Or Golfer’s Elbow? And the degeneration and Scar Tissue in your tendon(s) which weakens them and causes the worst of the pain. The VAST majority of treatments, therapies, remedies and so-called cures do not treat and address these muscle and tendon “root issues” – At least not with any efficiency. But it's rare (at least in the United States – Europe may be different) to receive anything more that a token “rub” for a few minutes – if that. Most of the emphasis is on insurance-billable but clinically-unproven tech, like E-stim, Ultrasound, Extracorporeal Shock Wave Therapy and various forms of Cryotherapy (icing) - and on the rehab exercises you're assigned and have to do on your own, anyway. None of this has any significant effect on muscular adhesions, Scar Tissue and tendon degeneration, in my opinion and experience. I would recommend going to see a practitioner like myself who specializes in manipulating muscles and tendons – and actually treats these root causes. But to be honest, that can be rather expensive, so one other alternative – Especially if you're highly motivated to avoid surgery, is my self-help program. The cost is minimal, there's a solid guarantee, there's almost no downside (unlike the risks associated with surgery) and it's something you can do at home without going anywhere - And put as much energy into as you're motivated to. RE: SURGERY: WHEN IS IT TIME? I rarely respond to circulars, but on this occasion feel I must. In my case I escaped a cycle of progressively worsening tennis elbow (which was impacting my job as a golf writer) … the escape route was SURGERY ….. quick, painless and highly effective. After 4 yrs of massage, arm braces, electric pulse treatments, hyaluronic acid injections, cortisone injections (twice), hundreds of physio sessions, long periods of rest and trying all your various massage techniques …. a friend who had surgery on his tennis elbow strongly advised I do the same. I found an excellent London-based surgeon who specialises in wrists, elbows and shoulders. Result (after an MRI scan and surgery) ….. I have no more tennis elbow, and enjoy pain-free golf. Since the surgery I’ve recommended this route to friends … none have regretted it. In fact all were left wondering why they waited so long. During all my treatments I was routinely told to regard surgery as a “treatment of absolute last resort” to be entered into at your “dire peril”. The advice scared me away from surgery and severely delayed the one effective treatment for my condition. After the surgical intervention and a four month recovery period, I was fully recovered and have had no recurrence of the tennis elbow over the last three years. As far as golfers are concerned, one serious piece of advice you should disseminate is NEVER, NEVER, NEVER practice on hard golf mats (as found on many driving ranges). No matter how much you want to improve your game, practicing on hard mats is, in my experience (and that of many others), the fastest way to tennis elbow for a golfer. Thank you for sharing all of that, Nigel! – Especially the warning to golfers about the hard mats on driving ranges. Much appreciated. Yes, sometimes surgery is going to be the way to go and some people might be a lot better off if they could come to that conclusion sooner – Some, however, will still want to avoid surgery at all costs. Some years ago I had a very wealthy business man (and an avid if not obsessed golfer) patient who had Tennis Elbow, and was told, based on an MRI scan, that he had a moderate tendon tear and would be a very good candidate for surgery. Money was no object for him but he spent a great deal of time driving back and forth from the Silicon Valley area to my practice (1 hour each way) to receive at least a dozen treatments (healing a moderate tear takes a lot) and was very happy to successfully recover without surgery. I think it’s very important to be very clear with oneself about what one’s priorities are. Who is the London surgeon? That sounds terrible, Anita. All the best to you in your recovery! can the do surgery on my elbow a second time? Im having problems with it again or what is the next step? I’m also in the same boat, I had arthroscopic surgery 5/2015 and continue to have pain. I’ve been going to pain management for almost a year now, also with minimal improvement. I’ve had 2 PRP injections and prolotherapy twice between PRP injections. Just yesterday I had cervical epidural steroid injection. I feel like I’m running out of options. Any suggestions on what to do next if steroid doesn’t work? I have been dealing with what drs say is tennis elbow for 7 months now. I am a stay at home mom to 3 children under 3. I have tried ice, heat, cortisone injection, physical therapy, anti-inflammatory meds and a strap. Nothing is helping. I am in unbearable pain each day. I can’t grip, lift, or straighten my arm. It shakes so much when I try to stretch it out. My ortho dr doesn’t think I need an MRI yet but I am fed up with it. Should I try to seek treatment elsewhere or urge the Dr to do an MRI? I can’t continue to be in pain to the point where I cry it is so bad. I’m sorry to hear you’re in so much pain, Mary. It must be incredibly difficult trying to manage that with three kids under 3 – Wow! Hang in there. I hope hope you’ve been able to spend some time on this site learning about Tennis Elbow – Especially about why most of those “treatments” you mentioned don’t address the root cause and may even make it worse (cortisone and the anti’s, in particular.) But I don’t imagine you have a lot of free time! I can’t say whether it’s time to press for an MRI or not at this time. That has to be your call. an intrasubstance tear which was measured at 6 x 2.8 x 2.2 mm. Associated tenderness over the common extensor tendon origin. Unremarkable ultrasonographic appearances of the remainder of the left elbow. intrasubstance tear at the deep aspect of the common extensor tendon origin. Hi I’m currently awaiting my appointment with orthopaedic surgeon but could you please explain to me what the report is saying? I have been struggling with elbow pain on and off for 5 years and have had multiple steroid injections. I had an MRI of my elbow about 6 months ago, after my elbow had an increase in swelling, and it showed complete disruption of the radial collateral ligament and avulsion of the common flexor tendon. My pain, at that time, had actually decreased so the physician said that the inflamed ligament and tendon released itself. Now, 6 months later, I am having pain and swelling again. Hi Anna, I’m so sorry to hear you’ve been in pain on and off for 5 years. It sounds like you have significant damage – The kind that is often surgically correctable. You had an Avulsion Fracture? That’s pretty serious! I don’t understand what the doctor means by “released itself” though – A tendon tearing away from the bone and taking a piece of the bone with it doesn’t sound like a release. It sounds like a big rip that has little chance of healing. I would say there’s a very good chance your pain is from the same issue. Was that physician you mentioned a surgeon? I think I would be consulting with an Orthopedic Surgeon at this point if I were you. All the best! Hello, Dy. I’m sorry to hear about your shoulder and elbow injuries. And I’m sorry, I can’t give you direct medical advice – but I wish you all the best and hope the article and video were helpful to you in your education and decision-making process. My mri just came back with a finding of a moderate to high grade partial tear of the common extensor tendon.I have a physical job and am very active,including lifting weights.In your opinion,do you think i could try your program,work around the injury,and try prp therapy and have it heal ,or should I get surgery.Thanks for any input in advance. I have had tennis elbow for about 3 years now and am always in a lot of pain. I’ve had 3 cortisone shots and a plasma transfusion. And my elbow is still in excruciating pain. My doctor told me straight up “this is just something you’re going to have to live with for the rest of your life”. I couldn’t believe what I was hearing. I absolutely cannot accept that. He said that he will send me to a specialist, but that he will tell me the exact same thing. There has to be something else. They never took any x-rays nor an MRI. He also said that surgery is only a 50/50 chance. I can’t believe that either. Do you have any advise on what to do next? Is surgery a good option? I just can’t help but think that we can put a man on the moon, but can’t heal an elbow. I have to say, I don’t like the sound of your Doctor! In my opinion, when they say “this is just something you’re going to have to live with for the rest of your life” they often have no actual idea whether this is true or not. I think the truth is often that they don’t know, and they don’t have any answers, but their arrogance forces them to think that if they don’t have the solution for you – no one does – and, therefore, you will continue to suffer. As far as surgery goes, we don’t have any idea whether you really need it or not (without an MRI – or at least a Sonogram) Maybe you have a lot of damage, possibly including a tear – maybe not. My advice may sound self serving, but have you considered purchasing my program? Hello. Ive dealt with tennis elbow for 4 yrs. Had a total of 4 cortisone injections. Finally haf surgery on may 7th. No pain yet, arm is weak and forearm still numb. Sorry I didn’t get back to you in time, Melessa! (But I would have answered that that’s a question for your Surgeon, Doctor or Physical Therapist to answer, anyway.) I hope you’re recovering well, now, though! I have had extreme pain in my right elbow for close to 6 months now with no relief. It is impossible to extend my arm and pickup or squeeze anything. I’m confident its tennis elbow but I hate going to the doctor especially when they just say rest it or take this.. I’ve rested my elbow repeatedly and already take anti-inflammatory medication for RA. Nothing seems to help! Any suggestions?